‍Victor simply enjoys building software that makes people happy. In his early days as a computer science student, he thought the only means to that end would be a career in video games. However, as he matured, Victor realized that making intuitive, powerful software that people work with on a day-to-day basis can bring just as much joy. So now he does exactly that, focusing on front-end development where he can more directly deliver a pleasant experience to his users. Victor majored in CS at Rice University, where he spent a lot of his time with the “marching” band playing the accordion and leading the miscellaneous and mysterious Electronics Section. Once he entered the workforce he was able to gain experience in the oil and gas and airline industries, among others. He jumped on the first chance he got to work on a web app and hasn’t looked back since. 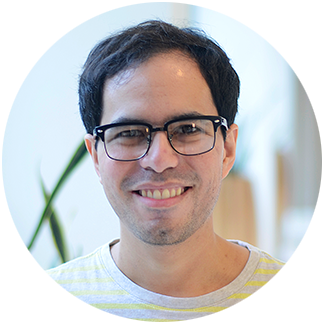 When he’s not celebrating a fixed bug or a delivered feature at work, Victor spends his time playing video games or writing non-code words. He amassed a collection of Lego sets from his childhood and earlier eras that had to stop growing before it became a problem. Sometimes he can be found guilting himself into practicing the accordion or bass guitar. Occasionally he will spend a little too long thinking about how his dog is an animal that lives in his house.